Richmond is getting hotter. Teenagers are designing projects to help. Last year, they planted peach trees. 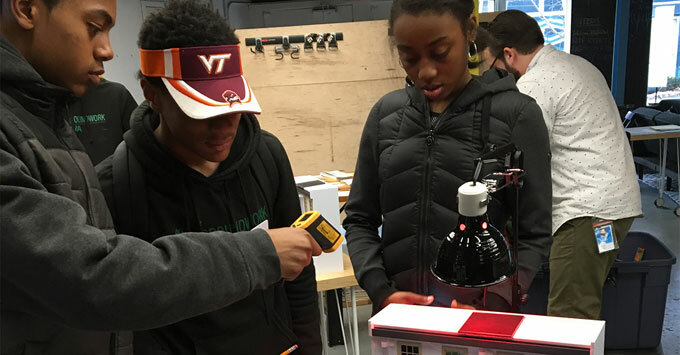 In Richmond, Virginia, teens are measuring the heat in their neighborhoods and developing projects to cool them off. Jeremy Hoffman of the Science Museum of Virginia leads the Throwing Shade in RVA program. It began last year as a partnership with Groundwork RVA, a nonprofit that works with youth to green the city. He says the teens first experiment with models, a heat lamp, and infrared thermometers to see how roads and buildings quickly heat up in the hot sun. Finally, the students design solutions. Last year, they planted three peach trees to provide food and shade. It’s not enough to affect city-wide temperatures, but Hoffman says the program prepared the teens to take on bigger projects in the future. Reporting credit: Sara Peach, ChavoBart Digital Media.